Pathology, Tufts University, School of Dental Medicine, 55 Kneeland Street, Boston, MA 02111,. USA .... Normal human keratinocytes (NHK) were isolated from. Feb 29, 2016 - Renewable energy sources like wind and solar can be utilized for the generation ... to hydrogen (H2) and bromine (Br2) using electrical energy. Han SO et al. prepared ultrafine .... results found by Han SO . The solution of CA in .... Han SO, Youk JH, Min KD, Kang YO, Park WH. 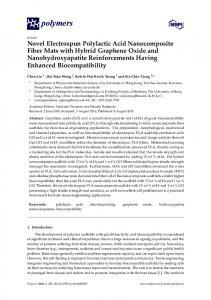 Electrospinning of. Jul 11, 2014 - 2010; Muller, Rambo, Porto, Schreiner, & Barra, 2013; Sahay et al.,. 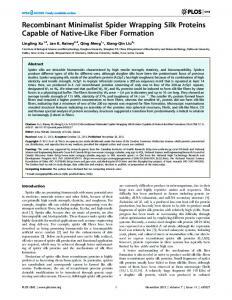 2012 ..... CPAD, (iii) surface initiated RAFT polymerization of VBTAC. Fig. 1. Feb 21, 2017 - among graphene, carbon nanotubes, nanodiamonds and fullerenes and ..... In fact, the drastic conditions of the detonation environment lead. 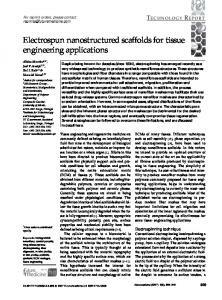 Jul 7, 2014 - Biocompatibility Evaluation of Electrospun Scaffolds of Poly (L-Lactide) with ... Key words: Biocompatibility, electrospun scaffolds, In vivo and In. Aug 8, 2016 - Differential scanning calorimetry (DSC, TA Instruments, New Castle, DE, USA) ...... A.; Romero, J.; Grande, D. Novel antibacterial electrospun. Thus, 1 nanometre = 1 nm = 10â9 metre = 10â9 m. Etymology. The Greek word ..... (2.4) where p is the internal pressure of the fluid, and Ï is the viscous force. © 2016 Wang et al. This work is published and licensed by Dove Medical Press Limited. The full terms of this license are available at https://www.dovepress.com/terms.php and incorporate the Creative Commons Attribution – Non Commercial (unported, v3.0) License (http://creativecommons.org/licenses/by-nc/3.0/). By accessing the work you hereby accept the Terms. Non-commercial uses of the work are permitted without any further permission from Dove Medical Press Limited, provided the work is properly attributed. For permission for commercial use of this work, please see paragraphs 4.2 and 5 of our Terms (https://www.dovepress.com/terms.php). acid) improves the interaction between osteoblasts and the scaffold.30 Therefore, we fabricated hybrid nanofibrous scaffolds by adding different weight ratios of SF to PLCL. 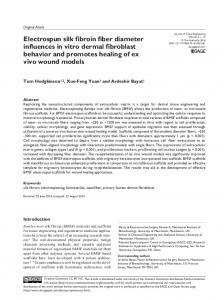 Systematic in vitro and in vivo experiments were conducted to evaluate the physiochemical properties of the SF/PLCL scaffolds, and explore the effects of SF/PLCL scaffolds on cell adhesion, viability, proliferation, and osteogenic differentiation and further test their ability to repair critical-sized calvarial defect (CSD). Based on these evaluations, we present a promising scaffold with good mechanical, physiochemical, and osteoinductive properties for bone regeneration. Materials and methods Materials Bombyx mori silkworm cocoons were generously provided by Jiaxing Silk Co. Ltd. (Jiaxing, People’s Republic of China). The PLCL polymer (with an average molecular weight of 300,000, poly(L-lactic acid) (LA) to polycaprolactone (CL) mole ratio 50:50) was supplied by Nara Medical University (Kashihara, Japan). The 1,1,1,3,3,3,-hexafluoro-2-propanol was purchased from Daikin (Daikin Industries Ltd., Osaka, Japan). 1,500 rpm was used. The obtained material films were dried in vacuum (50 mbar, 25°C) for 72 hours. MA, USA) in the range 4,000–600 cm−1 at a resolution of 4 cm−1. The electrospun nanofibrous scaffolds were cut into 8×8 mm pieces and coated with 10 nm of platinum before imaging by an SEM (JSM-6701; JEOL, Tokyo, Japan). The mean fiber diameters were estimated using image analysis software (Image-Pro Plus, Rockville, MD, USA) by selecting 60 fibers randomly from the SEM images. Atomic force microscopy (AFM) The roughness of the nanofibrous scaffold surfaces was measured using a scanning probe microscope (VECCO, New York, NY, USA) operated in AFM tapping mode at a microscopic level in air. The roughness value Ra represents the average distance between the surface and the mean line from recordings at each point and was calculated using the Nanoscope Image Processing software (VECCO). Contact angle measurement The contact angle was measured by a video contact angle instrument (Atension Theta, Turku, Finland), as previously reported,21 to evaluate membrane surface wettability. A 0.8 μL droplet was dropped onto the scaffold, and the angles between the water droplet and the surface were measured at 15 seconds. Five samples were used for each test. The average value with standard deviation was reported. Tensile strength tests The tensile mechanical properties of the SF/PLCL scaffolds were measured using a tabletop MicroTester (Instron 5542; Instron, Norwood, MA, USA). Samples with different ratios of SF/PLCL were prepared with a thickness of 150–200 μm and cut into sizes of 10×20 mm. Stress–strain curves of each sample were recorded under the application of a static tensile load of 10 N capacity as previously reported.31 Based on the stress–strain curves, the tensile strength and elongation at break were calculated. The highest stress prior to failure was the tensile strength of the sample. Five samples were tested for each group, and the mean data were collected. Wide-angle X-ray diffraction curves were obtained on an XRD (Riga Ku, Tokyo, Japan) within the scanning region of 2θ (5°–50°), with CuKα radiation (λ=1.5418 Å) at 40 kV and 40 mA. Thermogravimetric analyzer (TGA) The TGA experiments were performed using a NETZSCH STA 409C/3/F with a flow rate of 100 mL/min of nitrogen. Temperature was increased from RT to 1,000°C at a heating rate of 10°C/min. Isolation and culture of human ADSCs The hADSCs were isolated from human subcutaneous adipose tissue discarded from six outpatients who had undergone blepharoplasty (females, mean age 23.5 years, range 18–27 years), as previous reported.32 The Medical Ethics Committee of Ninth People’s Hospital, Shanghai Jiao Tong University School of Medicine approved the protocol in this study and written informed consents were obtained from all patients. In brief, adipose tissues were minced to small pieces and digested with 0.2% collagenase type 1 for 2 hours. The precipitated cells were cultured in α-MEM (Gibco BRL, Grand Island, NY, USA) containing 10% FBS and 100 units/mL penicillin at 37°C in an atmosphere of 5% CO2. The medium was renewed three times a week. Cell seeding Before cell seeding, the nanofibrous scaffolds were sterilized with 75% ethanol vapor at 37°C for at least 24 hours and then placed under an ultraviolet lamp for 3 hours. These scaffolds were washed three times with sterilized phosphate-buffered saline (PBS) and soaked in complete culture medium at 37°C overnight. The hADSCs were seeded at a density of 1×104 cm2 on electrospun nanofibrous scaffolds in 24-well plates. calcein acetoxymethyl ester and 2 mM ethidium homodimer 1 (Invitrogen) for 30 minutes at 37°C and then observed under a confocal laser scanning microscope (Carl Zeiss Microscopy, Oberkochen, Germany). with 4’,6-diamidino-2-phenylindole (DAPI) (Invitrogen) for 15 minutes at RT. Images were visualized and imaged on a Leica TCS SP8 microscope (Leica Microsystems, Wetzlar, Germany). The cytotoxicity of the scaffolds of different blend ratios was assessed by measuring the cytosolic enzyme lactate dehydrogenase (LDH) released into the culture medium upon cell lysis using the CytoTox 96 Non-Radioactive Cytotoxicity Assay kit (Promega Biotech Co., Ltd., Beijing, People’s Republic of China). Cytotoxicity (%) was expressed as the percentage of LDH released into the medium out of the total LDH activity. The hADSCs were seeded on the SF/PLCL scaffolds and maintained in standard culture conditions for 24 hours before being cultured in osteogenic induction medium (complete medium supplemented with 50 μg/mL ascorbic acid, 0.01 M glycerol2-phosphate, and 10−7 M dexamethasone, all from Sigma). Adhesion of hADSCs to the scaffolds was evaluated by counting the cells that adhered to the surface of the polymer at 4 and 24 hours after cell seeding. The hADSCs were cultured for 4 and 24 hours on different scaffolds, and at each time point, the adherent hADSCs were enzymatically (0.25% trypsin–0.1% ethylene diamine tetraacetic acid [EDTA]; Gibco) detached and counted using a hemocytometer. The cell adhesion rate was expressed as a percentage of the initial number of seeded cells. The hADSCs were seeded on the different scaffolds at a density of 1.0×105 cells/well and cultured in osteogenic induction medium. At day 7, ALP staining was performed using a 5-bromo-4-chloro-3-indolyl phosphate/nitroblue tetrazoli (BCIP/NBT) Alkaline Phosphatase Color Development Kit (Beyotime Institute of Biotechnology, Shanghai, People’s Republic of China) according to the manufacturer’s instructions.35 Semiquantitative analysis of ALP activity was performed as previously reported.36 In brief, the cells were lysed using radio immunoprecipitation assay (RIPA) lysis buffer (Beyotime Institute of Biotechnology) and the total concentration of protein content was determined using a bicinchoninic acid (BCA) protein assay kit. Using p-nitrophenyl phosphate (Sigma) as the substrate, ALP activity was measured from the absorbance at 405 nm. The ALP levels were normalized to the total protein content. Cell proliferation Cell proliferation was examined using a cell counting kit-8 (CCK-8) according to the manufacturer’s instructions (Dojindo Molecular Technologies, Inc., Tokyo, Japan), as previously reported.34 For this purpose, 10 μL of CCK-8 solution was added to each well of the 96-well plate and incubated with the cells for 4 hours at 37°C. The absorbance was measured at a wavelength of 450 nm. Scanning electron microscopy The hADSCs were cultured on the nanofibrous scaffolds for 3 days, and the hADSCs seeded on the nanofibrous scaffolds underwent osteogenic differentiation for 14 days before being washed with PBS, fixed in 2% glutaraldehyde for 2 hours, dehydrated in a series of graded concentrations of ethanol, dried in vacuum, and gold-sputtered. The samples were imaged using SEM (JSM-6701; JEOL, Tokyo, Japan). Mineralization of ECM detection The calcium deposition and mineralization of osteoblastic ECM were detected by alizarin red S (ARS) staining and SEM. At day 14, the cells were fixed in 2% glutaraldehyde and examined by SEM. The cells on all types of scaffolds were also fixed and stained with ARS (1%, pH=4.1, Sigma) for 30 minutes at 37°C. For the semiquantitative analysis of ARS, the stain was desorbed with 10% cetylpyridinium chloride (Sigma) for 1 hour. The solution was collected and distributed at 100 μL per well on a 96-well plate for absorbance reading at 590 nm using a spectrophotometer (Thermo Spectronic, Carlsbad, CA, USA). The ARS levels were normalized to the total protein content. medium for 14 days. The cells were then fixed with 4% paraformaldehyd (PFA) (Sigma) and incubated in blocking buffer for 1 hour at RT, as reported.37 The cells were incubated with BSP and SATB2 (1:200; Abcam, Cambridge, MA, USA) overnight at 4°C and then incubated with fluorescently labeled secondary antibodies (1:800, Alexa Fluor546-goat anti-rabbit/mouse; BD Biosciences, San Jose, CA, USA) for 1 hour at RT. The cell nucleus was counterstained with DAPI (Invitrogen) for 15 minutes at RT. Immunoreactive cells were visualized and imaged on a Leica TCS SP8 microscope (Leica Microsystems). Images were constructed using Leica LAS AF software (Leica Microsystems, Heidelberg, Germany). Total RNA isolation and reverse transcription and quantitative polymerase chain reaction (qPCR) RNA isolation and qPCR were performed as previously reported.25 Scaffolds with cells were immersed into RNA extract buffer and ground on ice using a Bio-gen pro200 Homogenizer (PRO Scientific Inc., Oxford, UK). An RNeasy Mini Kit (Qiagen, Valencia, CA, USA) was used to extract total RNA. Then, 2 μg of total RNA was reverse transcribed in a 20 μL reaction volume using the PrimeScript™ RT Reagent Kit (Perfect Real Time; TaKaRa Biotechnology [Dalian] Co., Ltd., Dalian, People’s Republic of China) according to the protocol described by the manufacturer. The qPCR was conducted in a 20 µL reaction volume containing 10 µL of reaction mixture, 1 µL of complementary DNA, and 2 µL of primers using the Power SYBR Green PCR Master Mix (Thermo Fisher Scientific, Waltham, MA, USA) and a 7,500 Real-Time PCR Detection System. The primers are shown in Table 1. Each target gene was tested in triplicate. The relative gene expressions were expressed as the fold change relative to the untreated controls after normalization to the expression of glyceraldehyde-3-phosphatedehydrogenase (GAPDH). (Beyotime Institute of Biotechnology, Shanghai, People’s republic of China), supplemented with 1 nM phenylmethanesulfonyl fluoride (PMSF) (Invitrogen), then the collected protein contents were determined using a BCA protein assay kit (Thermo Fisher Scientific). Equal amounts of cell lysates were loaded in 10% sodium dodecyl sulfate-polyacrylamide gel electrophoresis gel and transferred to a polyvinylidene fluoride membrane (0.22 μm; EMD Millipore, Billerica, MA, USA). After blocking with 5% nonfat milk, the membranes were incubated with primary antibodies: anti-BSP (1:1,000, Abcam), anti-OPN (1:1,000, Abcam), anti-Ocn (1:1,000, Abcam), and anti-β-actin (1:3,000, Abcam) at 4°C overnight and then incubated for 1 hour with fluoresceinconjugated secondary antibodies (Abcam) at RT. Protein expression images were visualized using Odyssey V 3.0 image scanning (LI-COR Biosciences, Lincoln, NE, USA). Relative protein levels were normalized against β-actin. All experiments were performed in triplicate. Animal experiments All procedures were approved by the Animal Research Committee of Ninth People’s Hospital, Shanghai Jiao Tong University School of Medicine. Surgical procedures were performed on Sprague Dawley rats (8 weeks old, female, weight: 150–180 g), as previously reported.38 All animals received an oral dose of 100 mg/mL cyclosporine beginning 4 days prior to transplantation and continued until the last day of the experiment, according to a previous study.33 In brief, the animals were generally anesthetized (Nembutal 3.5 mg/100 g). The cranium was exposed by a blunt incision made on the scalp. A critical-sized cranial defect was made using an 8 mm-diameter trephine (Nouvag AG, Goldach, Switzerland), and a composite of nanofibrous scaffold and hADSCs was used to repair the CSDs of the rats. Eighteen rats were randomly allocated into the following graft study groups: 1) hADSCs/SF/PLCL (50/50), 2) hADSCs/pure PLCL, and 3) control (empty PLCL scaffold). The cell-seeded scaffolds were implanted into the defects, and the incisions were closed in layers using 4–0 resorbable sutures. Microcomputed tomography (micro-CT) measurement At 8 weeks post-operation, the specimens were collected and evaluated using an animal micro-CT scanner (mCT-80; Scanco Medical, Zurich, Switzerland) in high-resolution scanning mode (pixel matrix, 1,024; voxel size, 20 mm; slice thickness, 20 mm), as previously reported.39 Data were analyzed using the micro-CT image analysis software (Scanco Medica), including the bone mineral density and the percentage of new bone volume relative to tissue volume (BV/TV). Sequential fluorescent labeling Polychrome sequential fluorescent labeling for new bone formation was performed as described previously.38 The animals were intraperitoneally injected with fluorochromes as follows: tetracycline (1 mg/kg of body weight), alizarin red (3% in 2% sodium bicarbonate solution, 0.8 mL/kg of body weight), and calcein (1% in 2% sodium bicarbonate solution, 5 mL/kg of body weight) (all from Sigma) at 3, 6, and 9 weeks after the operation. Histological and histomorphometric analysis The skulls were harvested 12 weeks post-implantation. After dehydration in ascending concentrations of alcohol from 75% to 100%, the samples were embedded in polymethylmethacrylate. Three sagittal sections of the central area were cut and polished to a final thickness of ~40 mm as previously reported.40 The sections were stained with van Gieson’s picrofuchsin. Areas of newly formed bone were quantified using Image Pro Plus™ (Media Cybernetics, Silver Springs, MD, USA) and reported as a percentage of the entire bone defect area. All quantitative data are presented as the mean ± standard deviation unless specifically indicated otherwise. Each experiment was repeated at least three times. Statistical significance was determined using the unpaired Student’s t-test, and a value of P,0.05 was considered to be statistically significant. Figure 1 Characterization of SF/PLCL nanofibrous scaffolds of different weight ratios. Notes: (A) Representative scanning electron microscopy images of SF/PLCL nanofibrous scaffolds of different weight ratios: pure SF, SF/PLCL (75/25), SF/PLCL (50/50), SF/PLCL (25/75), and pure PLCL. Scale bars: 20 μm. (B) Atomic force microscopy images of SF/PLCL nanofibrous scaffolds of different weight ratios. The roughness value Ra represents the average distance between the surface and the mean line from the recordings at each point. The roughness value Ra represents the average distance between the surface and the mean line from recordings at each point. (C) Representative images of water contact angle of SF/PLCL nanofibrous scaffolds of different weight ratios at 15 seconds. (D) Water contact angle of SF/PLCL nanofibrous scaffolds of different weight ratios. (E) Tensile strength of SF/PLCL nanofibrous scaffolds of different weight ratios. Abbreviations: PLCL, poly(lactide-co-ε-caprolactone); SF, silk fibroin. 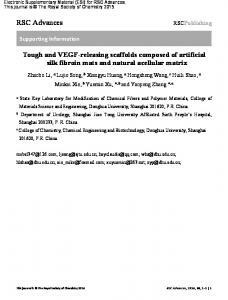 the hybrid SF/PLCL scaffolds possess characteristics of both materials, and all scaffolds were thermally stable. Abbreviations: PLCL, poly(lactide-co-ε-caprolactone); SD, standard deviation; SF, silk fibroin. Figure 2 Adhesion, viability, and proliferation of hADSCs on SF/PLCL nanofibrous scaffolds of different weight ratios. Notes: (A) Live/Dead staining of hADSCs on SF/PLCL nanofibrous scaffolds of different weight ratios after 3 days of culture. Scale bars: 200 μm. (B) Cell adhesion rates 4 and 24 hours post-cell seeding on SF/PLCL nanofibrous scaffolds of different weight ratios (*P,0.05). (C) CCK-8 analysis of the proliferation of hADSCs on SF/PLCL nanofibrous scaffolds of different weight ratios showed that the hADSCs on the SF/PLCL (50/50) scaffolds proliferated much more quickly than on other scaffolds. (D) LDH assays for acute cytotoxicity analysis of SF/PLCL nanofibrous scaffolds of different weight ratios showed no significant difference among groups. (E) Representative scanning electron microscopy images of hADSCs seeded on SF/PLCL nanofibrous scaffolds of different weight ratios after 3 days of culture. Scale bars: 300 μm. Abbreviations: TCP, tissue culture plate; CCK-8, cell counting kit-8; hADSCs, human adipose-derived stem cells; LDH, lactate dehydrogenase; PLCL, poly(lactide-co-εcaprolactone); SF, silk fibroin; h, hours. on the pure SF, SF/PLCL (75/25), and SF/PLCL (50/50) scaffolds was higher than the number of cells grown on the pure PLCL scaffold, and the highest cell number was observed on the SF/PLCL (50/50) scaffold (Figure 2E), which was consistent with the results of the Live/Dead staining (Figure 2A). Taken together, our results suggest that the SF/PLCL (50/50) scaffold was nontoxic and supported better proliferation of hADSCs than the scaffolds of other ratios. Figure 3 ALP activity and biomineralization of hADSCs on SF/PLCL nanofibrous scaffolds of different weight ratios. Notes: (A) ALP staining of hADSCs on SF/PLCL nanofibrous scaffolds of different weight ratios after 7 days of osteogenic induction. (B) Semiquantitative analysis of ALP activity showed that the intracellular ALP level of the hADSCs was significantly higher on the SF/PLCL (50/50) scaffold than on other scaffolds (*P,0.05, **P,0.01). (C) ARS staining of hADSCs on SF/PLCL nanofibrous scaffolds of different weight ratios after 14 days of osteogenic induction. (D) Semiquantitative analysis of ARS staining showed that the mineralization of hADSCs on scaffolds of pure SF, SF/PLCL (75/25), and SF/PLCL (50/50) were markedly higher than on scaffolds of pure PLCL (**P,0.01). (E) Representative scanning electron microscope images of the biomineralization of hADSCs on electrospun SF/PLCL scaffolds of different weight ratios after 14 days of osteogenic induction. The deposition of crystallized particles (arrows point to examples) was clearly higher on the surfaces of the hADSCs on the pure SF, SF/PLCL (75/25), and SF/PLCL (50/50) scaffolds than on other scaffolds. Scale bars: 20 μm. Abbreviations: ALP, alkaline phosphatase; ARS, alizarin red S; hADSCs, human adipose-derived stem cells; PLCL, poly(lactide-co-ε-caprolactone); SF, silk fibroin. seeded on the SF/PLCL (50/50) scaffold exhibited significantly higher ALP activity than on scaffolds with other ratios after 7 days of culture in osteogenic medium. In addition, we evaluated the matrix mineralization by ARS assays of hADSCs seeded on different scaffolds after osteogenic induction for 14 days. As shown in Figure 3C, calcium deposition was higher in the pure SF, SF/PLCL (75/25), and SF/PLCL (50/50) groups than in the SF/PLCL (25/75) and pure PLCL groups, and the results from the quantification of extracted ARS (Figure 3D) were consistent with the results of ARS staining. Furthermore, the SEM images of the mineralization of hADSCs cultured on the different scaffolds demonstrated that the deposition of crystallized particles was more obvious on the surfaces of the pure SF, SF/PLCL (75/25), and SF/PLCL (50/50) scaffolds and that these depositions were qualitatively greater on the SF/PLCL (50/50) scaffold (Figure 3E). Additionally, after incubation in osteogenic medium for 14 days, the expression levels of osteogenicspecific genes of hADSCs on different electrospun SF/PLCL scaffolds were detected by qPCR, as shown in Figure 4A. The mRNA expression levels of BSP, Ocn, Col1A, and OPN were notably upregulated in the SF/PLCL (50/50) group compared with other groups. Moreover, fluorescent images of the distribution of BSP and transcriptional factor SATB2 expression of hADSCs are shown in Figure 4B. The percentage of BSP-positive cells was significantly higher on the SF/ PLCL (50/50) scaffold than on other scaffolds (Figure 4C), and the ratio of SATB2-positive cells cultured on the SF/ PLCL (50/50) scaffold was markedly upregulated compared with that of cells cultured on other scaffolds (Figure 4D). As observed in Figure 4E and F, the western blot analysis showed that the protein expression levels of OPN, BSP, and Ocn of the cells seeded on the pure SF, SF/PLCL (75/25), and SF/PLCL (50/50) scaffolds were significantly higher than the protein expression levels of the cells seeded on the pure PLCL scaffold. Collectively, these results showed that blended SF/PLCL scaffolds enhanced hADSC osteogenic differentiation in vitro and that the SF/PLCL (50/50) scaffold performed the best. Figure 4 Osteogenesis of hADSCs on SF/PLCL nanofibrous scaffolds of different weight ratios. Notes: (A) qPCR results showed that the mRNA expression levels of osteogenic-specific genes such as BSP, Ocn, Col1A, and OPN were elevated in the pure SF, SF/PLCL (75/25), and SF/PLCL (50/50) groups, compared with the pure PLCL group. All data are averages from three independent experiments (*P,0.05, **P,0.01). (B) Cellular immunochemistry imaged by CLSM showed that the expression levels of BSP and SATB2 were higher in the pure SF, SF/PLCL (75/25), and SF/PLCL (50/50) groups, compared with the other two groups. Scale bars: 100 μm. Positive cell ratios of (C) BSP and (D) SATB2 were determined by dividing the number of immune-positive cells by the number of nuclei stained with Hoechst; 700–1,000 cells were counted in a random field for each group. All data are averages from three independent experiments. *P,0.05, **P,0.01. (E, F) Western blot results showed that the protein expression levels of osteogenic-specific genes such as OPN, BSP, and Ocn were significantly upregulated in the pure SF, SF/PLCL (75/25), and SF/PLCL (50/50) groups, compared with the pure PLCL group. All data are averages from three independent experiments, normalized to the internal control β-actin. *P,0.05, **P,0.01. Abbreviations: CLSM, confocal laser microscope; hADSCs, human adipose-derived stem cells; PLCL, poly(lactide-co-ε-caprolactone); qPCR, quantitative polymerase chain reaction; SF, silk fibroin. promote new bone formation more strongly than the pure PLCL scaffold in vivo. 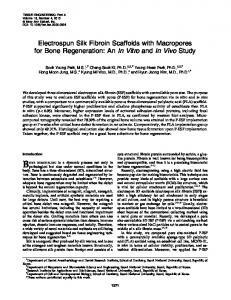 Collectively, the SF/PLCL (50/50) nanofibrous scaffold supported the proliferation and osteogenic differentiation of hADSCs better than other scaffolds in vitro and promoted new bone formation more strongly than the pure PLCL scaffold in vivo. Figure 5 Microcomputed tomography imaging of the repaired skull after 12 weeks post-implantation. Notes: (A) Representative 3D images and a sagittal view of harvested specimens showing the different reparative effects of hADSCs/SF/PLCL (50/50), hADSCs/pure PLCL, and the control groups. (B–D) BV/TV, Tb.N, and BMD variations in each group. *P,0.05, **P,0.01. Abbreviations: BMD, bone mineral density; BV/TV, bone volume/total volume; hADSCs, human adipose-derived stem cells; PLCL, poly(lactide-co-ε-caprolactone); SF, silk fibroin; Tb.N, trabecular number. Figure 6 Fluorochrome labeling analysis of new bone formation and mineralization. Notes: (A) Row 1 (yellow) shows tetracycline labeling at week 2; row 2 (green) shows calcein at week 4; row 3 (red) shows alizarin red at week 6; row 4 shows merged images of the three fluorochromes for the same group; and row 5 shows merged images of the three fluorochromes with the plain image for each group. (B) The percentages of each fluorochrome area for the different groups showed significant differences among the SF/PLCL (50/50), pure PLCL, and control groups. *P,0.05, **P,0.01. Abbreviations: PLCL, poly(lactide-co-ε-caprolactone); SF, silk fibroin. Figure 7 Histological evaluation of the newly formed bone. Notes: (A) The sliced specimens were stained with van Gieson’s picrofuchsin. Significant differences in reparative effects were observed among the SF/PLCL (50/50), pure PLCL, and control groups by analyzing (B) the newly formed bone area and (C) the percentage of newly formed bone with respect to total bone area. The arrows point out the fringe of the critical-sized calvarial bone defect. *P,0.05, **P,0.01. Abbreviations: PLCL, poly(lactide-co-ε-caprolactone); SF, silk fibroin. the results of ARS staining and semiquantitative assays showed similar patterns to those described earlier. Third, studies have shown that hydrophilic surfaces induce greater MSC osteogenesis and mineral deposition compared with hydrophobic surfaces.57–59 In this study, the incorporation of SF improved the hydrophilicity of the scaffold, which may also have partially contributed to the enhanced osteogenic differentiation and ECM mineralization of the hADSCs seeded on the SF/PLCL (50/50) scaffold compared with the pure PLCL scaffold. Furthermore, the incorporation of SF into the PLCL scaffold also introduces abundant functional groups (–OH, –COOH, –NH2) on the scaffold surface, which may also affect the osteogenic differentiation of MSCs and biomineralization of the ECM.58,60,61 Hence, the elevated osteogenic markers and enriched mineralized ECM noted in this study may also be attributed to the involvement of functional groups. Above all, the SF/PLCL (50/50) scaffold exhibited the best osteoinductive property, which may be due to the synergistic influences of surface roughness, SF protein, hydrophilicity, and functional groups incorporated on the surface of the scaffold. A CSD is the minimum defect that will not heal. 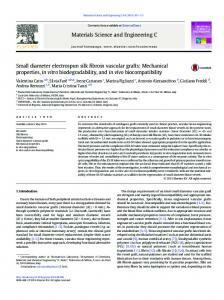 As the SF/PLCL (50/50) scaffold exhibited better physical properties and cellular responses in all assessments in the in vitro study, we further investigated its effect on repairing CSD in rats, and the pure PLCL scaffold was used as a control based on its good performance in a previous work.22 In the current study, a micro-CT analysis showed that the reparative effect of the composite of hADSCs and PLCL scaffold was significantly better than that of control (empty PLCL scaffold), which was consistent with a previous study reporting that MSC-seeded scaffold improves the healing of CSD.40 Moreover, micro-CT analysis also revealed that the SF/PLCL (50/50) scaffold markedly promoted new bone formation compared with the pure PLCL scaffold. Histological analysis and fluorochrome labeling analysis further validated the finding that the SF/ PLCL (50/50) scaffold performed better than the pure PLCL scaffold in repairing the CSD. Collectively, our data indicated that the SF/PLCL (50/50) scaffold meets the requirement for tensile strength in bone regeneration and enhanced in vivo new bone formation, compared with the pure PLCL scaffold. the repair of CSDs in rat, suggesting that electrospun SF/ PLCL (50/50) nanofibrous scaffold holds great potential for bone tissue regeneration. 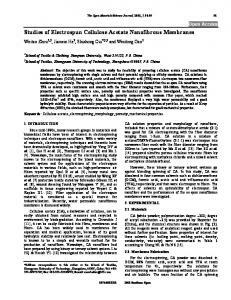 Acknowledgments This work was supported by the National High Technology Research and Development Program (863 Program) (2015AA020311), National Natural Science Foundation of China (81320108010, 81170876, 31271029, 81570883), and the Shanghai Municipality Commission for Science and Technology (14JC1493103, 12419A9300). The authors express their sincere thanks to Dr Qiao from the Key Laboratory of Medical Molecular Virology, Ministry of Education and Public Health, Shanghai Medical School, Fudan University for technical assistance with confocal laser microscope imaging and Dr Zhang from Shanghai Key Laboratory of Orthopedic Implants, Shanghai Jiao Tong University School of Medicine for technical assistance with histological analysis. Disclosure The authors report no conflict of interest in this work. 1. Calori GM, Colombo M, Mazza EL, Mazzola S, Malagoli E, Mineo GV. Incidence of donor site morbidity following harvesting from iliac crest or RIA graft. Injury. 2014;45 Suppl 6:S116–S120. 2. Cui L, Liu B, Liu G, et al. Repair of cranial bone defects with adipose derived stem cells and coral scaffold in a canine model. Biomaterials. 2007;28:5477–5486. 3. Younger EM, Chapman MW. Morbidity at bone graft donor sites. J Orthop Trauma. 1989;3:192–195. 4. Gaines ST. Infection in bone allografts. Incidence, nature, and treatment. J Bone Joint Surg Am. 1988;70:1430–1431. 5. Huri PY, Ozilgen BA, Hutton DL, Grayson WL. Scaffold pore size modulates in vitro osteogenesis of human adipose-derived stem/stromal cells. Biomed Mater. 2014;9:045003. 6. Shi YY, Nacamuli RP, Salim A, Longaker MT. The osteogenic potential of adipose-derived mesenchymal cells is maintained with aging. Plast Reconstr Surg. 2005;116:1686–1696. 7. Mirsaidi A, Kleinhans KN, Rimann M, et al. Telomere length, telomerase activity and osteogenic differentiation are maintained in adiposederived stromal cells from senile osteoporotic SAMP6 mice. J Tissue Eng Regen Med. 2012;6:378–390. 8. Egermann M, Heil P, Tami A, et al. Influence of defective bone marrow osteogenesis on fracture repair in an experimental model of senile osteoporosis. J Orthop Res. 2010;28:798–804. 9. Khan WS, Adesida AB, Tew SR, Andrew JG, Hardingham TE. The epitope characterisation and the osteogenic differentiation potential of human fat pad-derived stem cells is maintained with ageing in later life. Injury. 2009;40:150–157. 10. Rodriguez JP, Montecinos L, Rios S, Reyes P, Martínez J. Mesenchymal stem cells from osteoporotic patients produce a type I collagendeficient extracellular matrix favoring adipogenic differentiation. J Cell Biochem. 2000;79:557–565. 11. 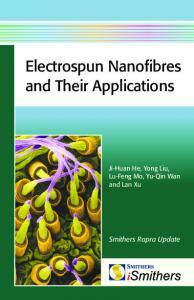 Liang D, Hsiao BS, Chu B. Functional electrospun nanofibrous scaffolds for biomedical applications. Adv Drug Deliv Rev. 2007;59: 1392–1412. Dovepress 33. Faghihi F, Baghaban Eslaminejad M, Nekookar A, Najar M, Salekdeh GH. The effect of purmorphamine and sirolimus on osteogenic differentiation of human bone marrow-derived mesenchymal stem cells. Biomed Pharmacother. 2013;67:31–38. 34. Jin GZ, Kim JJ, Park JH, et al. Biphasic nanofibrous constructs with seeded cell layers for osteochondral repair. Tissue Eng Part C Methods. 2014;20:895–904. 35. Xie Q, Wang Z, Bi X, et al. Effects of miR-31 on the osteogenesis of human mesenchymal stem cells. Biochem Biophys Res Commun. 2014; 446:98–104. 36. Deng Y, Bi X, Zhou H, et al. Repair of critical-sized bone defects with anti-miR-31-expressing bone marrow stromal stem cells and poly(glycerol sebacate) scaffolds. Eur Cell Mater. 2014;27:13–24; discussion 24–15. 37. Ni N, Zhang D, Xie Q, et al. Effects of let-7b and TLX on the proliferation and differentiation of retinal progenitor cells in vitro. Sci Rep. 2014;4:6671. 38. Zou D, Zhang Z, He J, et al. Repairing critical-sized calvarial defects with BMSCs modified by a constitutively active form of hypoxiainducible factor-1alpha and a phosphate cement scaffold. Biomaterials. 2011;32:9707–9718. 39. Deng Y, Zhou H, Zou D, et al. The role of miR-31-modified adipose tissue-derived stem cells in repairing rat critical-sized calvarial defects. Biomaterials. 2013;34:6717–6728. 40. Xie Q, Wang Z, Huang Y, et al. Characterization of human ethmoid sinus mucosa derived mesenchymal stem cells (hESMSCs) and the application of hESMSCs cell sheets in bone regeneration. Biomaterials. 2015;66:67–82. 41. Wu PH, Chung HY, Wang JH, et al. Amniotic membrane and adiposederived stem cell co-culture system enhances bone regeneration in a rat periodontal defect model. J Formos Med Assoc. Epub 2015 Jun 11. 42. Yoon E, Dhar S, Chun DE, Gharibjanian NA, Evans GR. In vivo osteogenic potential of human adipose-derived stem cells/poly lactideco-glycolic acid constructs for bone regeneration in a rat critical-sized calvarial defect model. Tissue Eng. 2007;13:619–627. 43. Xin X, Hussain M, Mao JJ. Continuing differentiation of human mesenchymal stem cells and induced chondrogenic and osteogenic lineages in electrospun PLGA nanofiber scaffold. Biomaterials. 2007;28: 316–325. 44. Hu J, Liu X, Ma PX. Induction of osteoblast differentiation phenotype on poly(L-lactic acid) nanofibrous matrix. Biomaterials. 2008;29: 3815–3821. 45. Jung SR, Song NJ, Yang DK, et al. Silk proteins stimulate osteoblast differentiation by suppressing the Notch signaling pathway in mesenchymal stem cells. Nutr Res. 2013;33:162–170. 46. 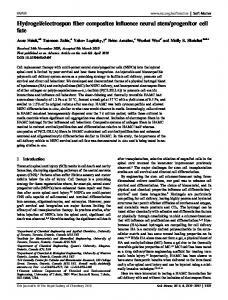 Curtis A, Wilkinson C. Topographical control of cells. Biomaterials. 1997;18:1573–1583. 47. Kim MS, Shin YN, Cho MH, et al. Adhesion behavior of human bone marrow stromal cells on differentially wettable polymer surfaces. Tissue Eng. 2007;13:2095–2103. 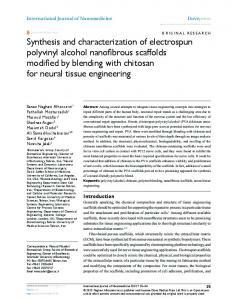 Nanofibrous scaffolds for bone regeneration 48. Deng Y, Liu X, Xu A, et al. Effect of surface roughness on osteogenesis in vitro and osseointegration in vivo of carbon fiber-reinforced polyetheretherketone-nanohydroxyapatite composite. Int J Nanomedicine. 2015;10:1425–1447. 49. Panda NN, Biswas A, Pramanik K, Jonnalagadda S. Enhanced osteogenic potential of human mesenchymal stem cells on electrospun nanofibrous scaffolds prepared from eri-tasar silk fibroin. J Biomed Mater Res Part B Appl Biomater. Epub 2014 Aug 30. 50. 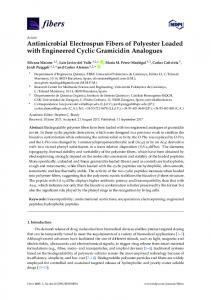 Grinnell F. Cellular adhesiveness and extracellular substrata. Int Rev Cytol. 1978;53:65–144. 51. Liu X, Lim JY, Donahue HJ, Dhurjati R, Mastro AM, Vogler EA. Influence of substratum surface chemistry/energy and topography on the human fetal osteoblastic cell line hFOB 1.19: Phenotypic and genotypic responses observed in vitro. Biomaterials. 2007;28:4535–4550. 52. Zhang D, Ni N, Chen J, et al. Electrospun SF/PLCL nanofibrous membrane: a potential scaffold for retinal progenitor cell proliferation and differentiation. Sci Rep. 2015;5:14326. 53. Wu Y, Zitelli JP, TenHuisen KS, Yu X, Libera MR. Differential response of Staphylococci and osteoblasts to varying titanium surface roughness. Biomaterials. 2011;32:951–960. 54. Takeuchi A, Ohtsuki C, Miyazaki T, Tanaka H, Yamazaki M, Tanihara M. Deposition of bone-like apatite on silk fiber in a solution that mimics extracellular fluid. J Biomed Mater Res Part A. 2003;65: 283–289. 55. Shanmugavel S, Reddy VJ, Ramakrishna S, Lakshmi B, Dev VG. Precipitation of hydroxyapatite on electrospun polycaprolactone/aloe vera/silk fibroin nanofibrous scaffolds for bone tissue engineering. J Biomater Appl. 2013;29:46–58. 56. 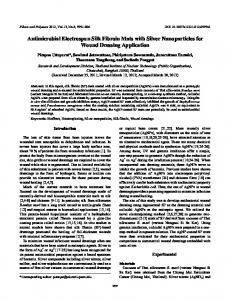 Vetsch JR, Paulsen SJ, Muller R, Hofmann S. Effect of fetal bovine serum on mineralization in silk fibroin scaffolds. Acta Biomater. 2015;13: 277–285. 57. Park JH, Olivares-Navarrete R, Wasilewski CE, Boyan BD, Tannenbaum R, Schwartz Z. Use of polyelectrolyte thin films to modulate osteoblast response to microstructured titanium surfaces. Biomaterials. 2012;33:5267–5277. 58. Bodhak S, Bose S, Bandyopadhyay A. Role of surface charge and wettability on early stage mineralization and bone cell-materials interactions of polarized hydroxyapatite. Acta Biomater. 2009;5:2178–2188. 59. Eliaz N, Shmueli S, Shur I, Benayahu D, Aronov D, Rosenman G. The effect of surface treatment on the surface texture and contact angle of electrochemically deposited hydroxyapatite coating and on its interaction with bone-forming cells. Acta Biomater. 2009;5:3178–3191. 60. Curran JM, Fawcett S, Hamilton L, et al. The osteogenic response of mesenchymal stem cells to an injectable PLGA bone regeneration system. Biomaterials. 2013;34:9352–9364. 61. Curran JM, Chen R, Hunt JA. The guidance of human mesenchymal stem cell differentiation in vitro by controlled modifications to the cell substrate. Biomaterials. 2006;27:4783–4793. Figure S1 The phase structure and thermal analysis of SF/PLCL nanofibrous scaffolds of different weight ratios. Notes: (A) FTIR-ATR spectra of SF/PLCL nanofibrous scaffolds of different weight ratios. (B) X-ray diffraction curves of SF/PLCL nanofibrous scaffolds of different weight ratios. (C) Thermogravimetric analysis curves of SF/PLCL nanofibrous scaffolds of different weight ratios. Abbreviations: FTIR-ATR, Fourier transform infrared Attenuated total reflectance spectroscopy; PLCL, poly(lactide-co-ε-caprolactone); SF, silk fibroin. Figure S2 F-Actin of hADSCs seeded on SF/PLCL nanofibrous scaffolds of different weight ratios. Scale bars: 20 μm. Abbreviations: hADSCs, human adipose-derived stem cells; PLCL, poly(lactide-co-ε-caprolactone); SF, silk fibroin. 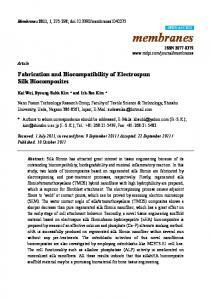 Report "Electrospun silk fibroin/poly(lactide-co-Îµ ... - Semantic Scholar"